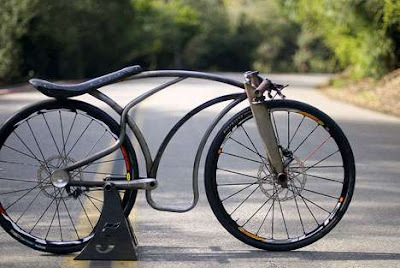 I could see this as my next project (Once the tall bike is complete). Full suspension stretched and lowered bike frames. suspension BMX forks and Hayes hydraulic disc brakes. Plug this into 20" Velocity Wheels with freestyle racing slicks and you have the ultimate downhill speed bike. Racing downhill with no cranks or pedals, riders kneel in an aero tuck behind a fiberglass motorcycle fairing. These Down Hill Rockets have been clocked at speeds in excess, of 90mph, and are earning faster qualification times than the more commonly known downhill sport Street Luge.""